I have been neglecting my blog a little bit. To catch up, I have been mostly spinning lately, with some knitting sprinkled in here and there. Lets see. Ispent most of the last month spinning up all of my gray woo l. I was doing the Yarn Everyday in April group on Ravelry so most of that was spent spinning mass amounts of thin (for me) gray yarn. I didn’t really like working with it at first because it kind of resembled dryer lint. It would have pieces in it that were on the extra fuzzy side. No big deal. I worked around it. 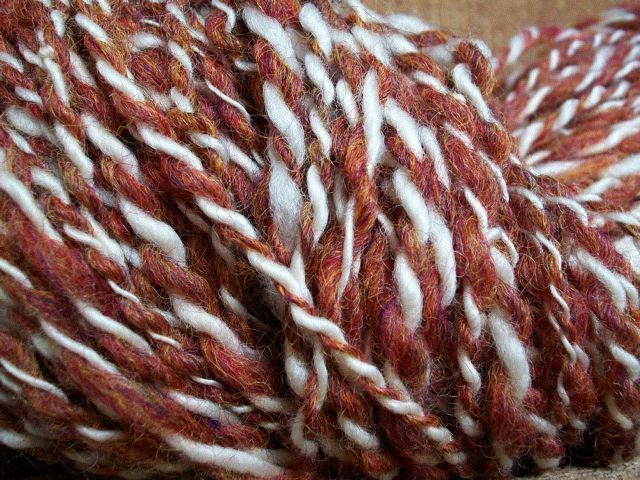 It is about 408 yards plied and I still have a little left on one bobbin. 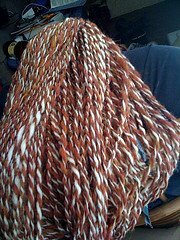 I don’t know for sure what I am going to do with it but I am thinking of Navajo plying it just to get a free bobbin. I need to buy more bobbins as I only have the two regular ones and then the one big one for plying. Of course I would really LOVE to get a new wheel… *sigh*. It isn’t that I don’t like my babe, it is just that I would prefer a wheel that is a little bit steadier. If that makes sense. Anyway besides the gray I also have a little purple and yellow that I have been spinning for a single. I don’t think I care much for it. At all. 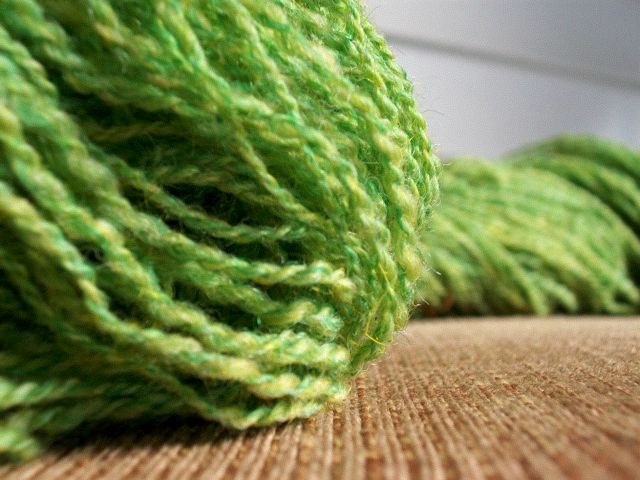 I just went yesterday and bought some more of the fiber like the spice that I spun before, only this stuff is bright green and yellow! Happy colors. I have been playing some with my drop spindle. I really am trying to make it work for me. It is getting better I suppose. What else? 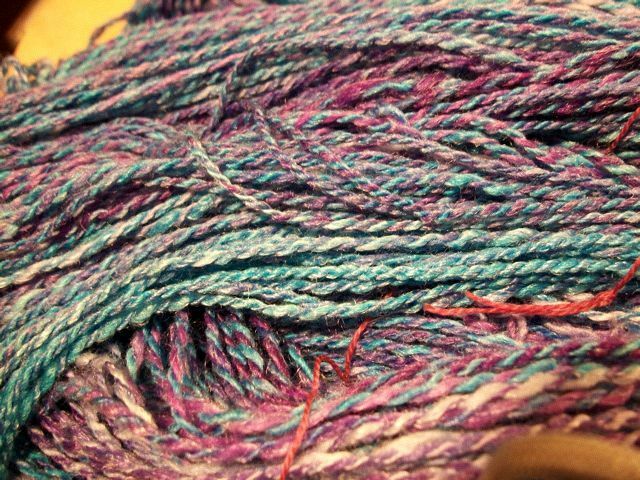 Lets see I decided that for Easter, instead of dying eggs, I would try my hand at dying yarn! 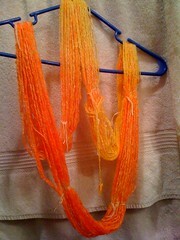 Since orange is my favorite color I decided to dye it orange and yellow! I was very pleased. I used food coloring and vinegar. It was super easy and I was suprised at just how much I enjoyed doing it. I also tried dying some fiber with KoolAid and um…. was less than happy with my results. I don’t know if I did something wrong. I didn’t agitate or anything, but it seems that it felted a tiny bit in places. Not all over. In fact that is the purple and yellow that I am spinning up. There were just a few small pieces that wouldn’t spin. No big. I haven’t been doing much knitting. A couple dish cloths. I started a sock for Jim that I really don’t like the yarn for. I have started a lace shawl. I am knitting http://www.ravelry.com/patterns/library/creatures-of-the-reef-shawl right now. Since we are moving to Florida I thought that it would be appropriate. : ) This is my first attempt at lace knitting. I went to LYS last night and she helped me figure out some of the things I had questions on. There was some stuff written in there that I really just needed to hear someone else say because it didn’t make sense when I read it. I started it last night and am only a couple rows in but so far I like the pattern. I have only done one row today because I am kind of feeling blah today. I am not sure that counting is a good idea for me today! LOL! Maybe I will make some lunch and then knit. That sounds like a good plan. Finished yarn and Wicked sweater. 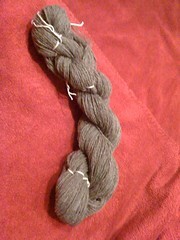 I got my first handspun all done, plied, and set. I am happy with it except the color doesn’t thrill me. But there it is finished and happy! I haven’t checked to see what the WPI is yet. I would do it right now but the cat is on my lap along with my knitting and my dog has me trapt on one side. I love that my animals help me procrastinate! Good puppy and kitty. I decided to start working on Wicked again. I had put it aside and was going to frog it later on. I needed the needles it was on so I put it on scrap yarn. I am glad that I decided to do that instead of just frogging it. I would have had to start all the way over. Instead I spend the time picking the stitches back up. That was exciting (note sacrcasm). I actually had no troubles figuring out where I was in the pattern. That made me pretty happy. Oh and I have this nifty little App on my iPhone called StitchMinder. I really like it helped me in counting all of those billions of stitches every other row. I am kind of funny when it comes to counting stitches. So every other row is an increase row and the following row is a straight knit row, and I count the stitches after every knit row. I can tell by looking at it that I made all the proper increases and everything, but I am always so afraid that I am going to mess up and have to figure out whe re to rip back to to fix my mistakes that it is just easier for me to go along and count every other row. I have been counting to each stitch marker then putting the number of stitches in my stitch counter thing. I know that I could do tons of other things, but it is easy for me and I can see it really well. I guess I am a little weird but whatever. It works really well for me. I didn’t have to rip back at all. Now I am on straight stockinette for a little bit before I have more shaping. It took me a while to figure out what was going on with the sleeves since I haven’t done a top down sweater before, but I did what I always do and just followed the directions exactly how they were written and after I got past the first sleeve… well it made total sense. Sometimes I just need to do what is said and not question it. As you can see in the picture, it is a little over 2 inches below the arm holes. 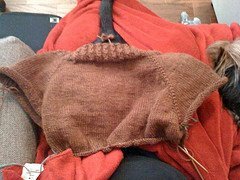 Can’t see it well because it is on on the needles, and on the cat, but it is. I tried it on when I got the sleeves on the waste yarn and I am pretty happy with it I think. I am not completely sure, but I think it will be good. I really liked the size of the arm holes. I think that the weird neck on it will be good. I am a little concerned about the size of the rest of the sweater, since I am “thick” through the middle. Ok. Fat. Whatever. Maybe this will make me want to lose weight. Yeah. Right. Like that’s going to happen. The problem with losing weight is I really need to exercise and that would take time away from knitting, spinning, school, work, my husband, and sleep. I am trying to finish school right now. Ok well I have absolutely NO classes that are a part of the certificate now that I am getting (Entrepreneurship) instead of getting an actual Associates or Bachelors, at least for now, I guess I am starting school instead of finishing it. That is depressing. It is going to be hell for the next couple years but I really want this. So I am having to shove everything I can into all the little holes between this and that in my life. I had a test in my class on Wednesday so I had no studying for the entire weekend. I really don’t have much to knit right now due to lack of good yarn so I got on Ravelry and looked at some different patterns people have used the Cascade 220 for. It was between Snow White and Wicked. I decided to finish Wicked. I am still trying to decide on the front pocket, but I am leaning away from it. I can wear it to work if I don’t have a pocket. I don’t think that they would feel it appropriate with it. But just a sweater I could get away with. I still want to knit Snow White, but it will just have to wait. I need different yarn for it anyway. I am thinking of making it a color that would look really nice with my black pants with a white button up under it… Hmmm. Maybe pink would be good. I like pink… Or blue. Crap. I will never be able to make up my mind. Anyway. That is what I have going on in the knitting world. 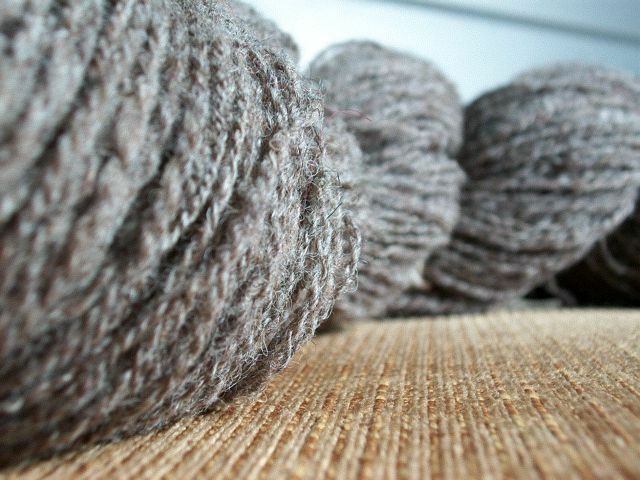 Oh and I found out that KnitPicks has the same yarn that I was using for the Fog sweater for DH. The one that I have two inches left to go and ran out of yarn.. Yeah. So when I get the money, if I can’t make it to KnitWicks, I can always order it from KnitPicks. So even though he won’t get to wear the sweater this year : ( It will eventually get done. It is just not easy to drop $20 for 2 inches. I guess I will make a dog sweater with the rest of it. Or a scarf. I don’t know. 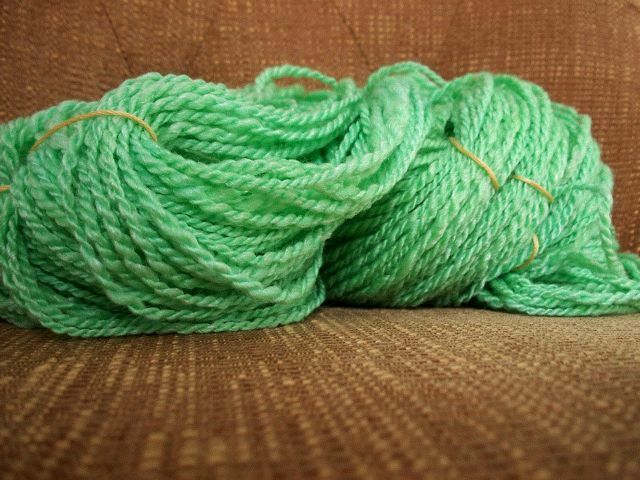 I hate having to buy that much yarn (almost 500 yards) for 2 inches. Well 2 inches and seaming.